Bannerman Island is one of those elusive places that New Yorkers have yet to become jaded about. We think it’s because the story of the island is so fascinating and the architecture so unique. And unlike other ruins in the New York area, this one is truly in danger of disappearing. The decaying castle structures were built near the town of Beacon, New York by Scottish-American entrepreneur Francis Bannerman as warehouses for his business “Bannerman’s,” a catalog business for war surplus (including munitions and large artillery). Originally based in Brooklyn and later Manhattan, Bannerman’s was forced to relocate when it procured a large stash from the Spanish American War, much of which was too dangerous to have within city limits. 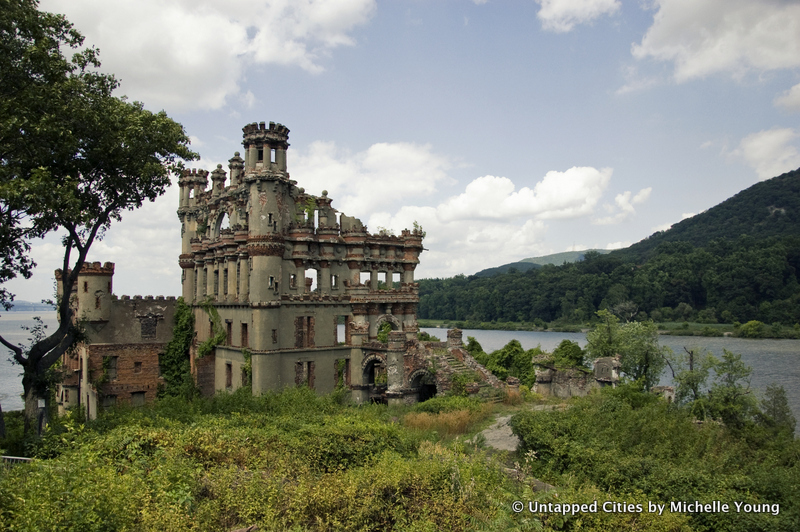 Our tour of Bannerman Castle is currently sold out! Sign up for advance notice of new dates and waitlist openings! The Bannermans discovered the island by accident while canoeing on the Hudson and purchased it from an eccentric husband and wife duo named Mary and Anthony Taft for $600 (plus $1000 in notes that were paid off over two years). The Bannermans had to promise in writing that the island would not go back to its past use as a haven for illegal alcohol and prostitution. [Incidentally, one of the occupants of the island before the Tafts enjoyed dressing and acting as Queen Victoria, pretending that her husband was Prince Albert]. Francis Bannerman built the structures gradually. He was not an architect, but would draw elements on napkins and envelopes based on castles he saw on travels to Europe, and give the sketches to his construction workers to build. A breakwater system had to be built to ensure safe docking for shipments and the rocky island had to be dynamited to provide enough flat land for building the structures. The warehouses were constructed from brick and concrete and great attention was paid to the shields and sigils of the family and their Scottish-American heritage. Whenever the family wanted to get fancy, they could simply pull out some of the war paraphernalia from storage. The current state of the structures are the result of a number of unfortunate incidents. In 1918, Francis Bannerman died and his family lost interest in maintaining the buildings. The powerhouse exploded in 1920, sending debris all the way across the Hudson and blowing out some of the warehouse windows. The gradual construction of the warehouses meant that buildings were supported by one another, lending a fundamental weakness to the design. In addition to the natural toll of time, a particularly harsh winter in 2010 led to the collapse of two major walls of the tallest warehouse. Perhaps the most architectural outhouse ever built, accommodated two! The family house was stabilized, but to preserve the warehouses, the Bannerman Castle Trust must raise $150,000 in funds to match a grant awarded by the New York State Environmental Protection Fund. The island, says Jane Bannerman, one of family descendants, should be “preserved as proof of people’s and imagination” in America during that time. Next, check out 20 abandoned places in NYC. Get in touch with the author @untappedmich. Great article! Everytime I pass this via Amtrak, I’ve wondered what it was. Thanks @foursquare for pointing it out. Thanks Michael! You can visit Bannerman’s Island as well, which is a great experience. We’re hoping to do an event there in the spring. Does the tour take you inside the residence or is it unsafe? Great story. I’d never heard of this place before. You can’t go inside the residence yet but you can walk up to it on the tour. The warehouses are not stable enough to go inside.